Between the thundering waves of the Atlantic Ocean and the brittle, sharp peaks of the Pyrenees, Bilbao is at the heart of Spain's Basque Country. Evolving over the centuries from a fishing and trade port to post-industrial grime to a cultural mecca, Bilbao, in its newest iteration, is establishing itself as a critical stop on the world mountain-film-festival circuit. 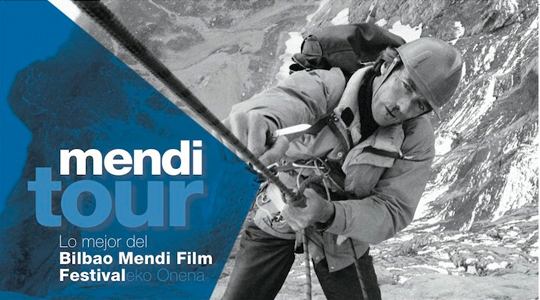 The Mendi Film Festival (MFF), only seven years old, draws top films, filmmakers and climbers from around the world to celebrate alpinism and the art of conveying all the emotions, experiences and values of alpinistic pursuits. "Mendi" means "mountain" in Basque, a language with no partners or family. When you ask a new friend in the Basque region how long his family has lived in the hills around Bilbao, he shrugs, gestures and says simply, "Forever." Founded in 2008, the Mendi Film Festival is the brainchild of two friends and fellow climbers, Eduardo Martinez and Jabier 'Jabi' Baraiazarra. Lovers of climbing and cinema, the men first crossed paths during a film project, Seven Walls, Seven Continents, led by the fascinating, tragic and storied brothers Eneko and Iker Pou [Click here to read their story, The Brotherhood, on alpinist.com—Ed.]. Part of the International Alliance for Mountain Film, the festival is already a world-class gathering and well worth the trip to the Basque Region. Martinez, co-founder and president of the festival, filmed and photographed an early ascent of the route El Nino (5.13b/c A0, Alex Huber-Thomas Huber, 1998) on El Capitan. Baraiazarra, co-founder and director of the MFF, took part in the remaining six climbs of the documentary project, filming and photographing all the way. Seven documentaries directed by Baraiazarra sprung from this project. These experiences and films were the first steps along the path to founding Mendi. The 2014 MFF saw more than seven-thousand people attend screenings of scores of films from 22 different countries. Thousands more came to attend workshops—including video and photography courses; listen to panels of climbers, skiers and filmmakers; and enjoy photography exhibitions, one standout being Rivers of Ice, by David Breashears, which was shown in the spotless Bilbao Metro and seen by more than one million people. Alpinist and Backcountry Magazine were invited to the 7th annual festival in December 2014. Everything impressed us—the revitalized ancient city, with its meandering steel-gray river; the Guggenheim Museum, itself a piece of art matched only by the works within; the filmmakers, adventurers and festival organizers, all singularly focused on celebrating mountaineering; and the tapas and thick, blood-red wine and the bars where we ate and drank, listening to Tom Petty cover bands. And through it all we experienced top films by accomplished climbers and filmmakers. Climbers at the 2014 festival were everywhere, and included Alberto Zerain, who featured in the sobering and captivating Irish film The Summit; artist and climber Jeremy Collins, whose animated film Drawn won Best Script and a special award for communicating the social values of alpinism; and Edurne Pasaban, the first woman to climb all fourteen eight-thousand-meter peaks. Alpinist and Backcountry Magazine are proud to sponsor the 2015 Mendi Film Festival. If you have a film, submissions opened on April 13 and can be made here. The festival will take place December 11 through 20, 2015.